Established by Terri Rundle in 2006, Soca Gallery is a venue for well-known and emerging artists and has presented fine art paintings, photography, ceramics and handmade furniture exhibitions by a diverse mix of artists such as John Waddell, Philip Curtis, Mark McDowell, Robert Miley, Vladimir and Daniella Ovtcharov, and Shari Bombeck. Events at the art gallery include celebrations of all kinds; benefits and fundraisers for charities, holiday parties, wedding receptions and cocktail parties. Some favorites were the wildly popular performance by Melanie, a photography exhibit of work by special needs students; Salon Paris, reminiscent of 1800’s Paris, where artists painted canvases while guests dressed in period garb mingled with them for the evening; and Beyond Belief, an exemplary collection of historical religious artifacts. Soca Gallery is home to a substantial ethnographic collection of African and Asian art, Tibetan Singing Bowls, handmade jewelry, leather handbags, Moroccan wedding blankets, Turkish rugs, hand loomed linen pillows, decor and textiles from around the world. We invite you to connect with us as we continue on our journey. 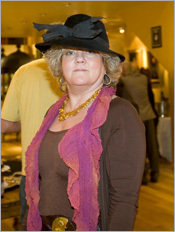 Terri is a fourth generation Arizonian whose heritage is a diverse group of artisans, bakers, retailers and politicians. She was able to parlay her deep-rooted skill set into Soca Gallery in 2006 where her collections of art, objects and textiles from past eras and cultures found a home alongside her handmade leather boho inspired handbags and jewelry. In addition to hosting contemporary artist’s exhibitions, fundraisers, and carefully curating objects, Terri Rundle and Cattletrack Press co-published a signed, limited edition, contemplative art book by John J. Moore, PhD. Letter pressed on natural handmade papers with colorful raw silk covers, the handcrafted books include etchings by Mark McDowell. Above all Terri is an artistic freethinker with an untiring penchant for seeking out the cool and unusual. With a treasure trove of longtime friends, acquaintances and professional sources, she connects people, places and things into meaningful relationships that benefit others. SOCA Gallery has been blessed with an abundance of publicity since its October 2006 opening. Simply click below to read any of the articles.